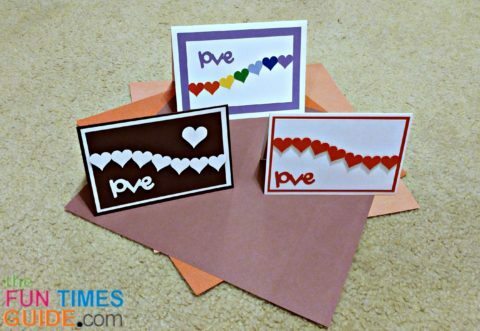 This rainbow heart card inspired me to make my own version as a homemade Valentine’s Day card. I started with the rainbow hearts version. 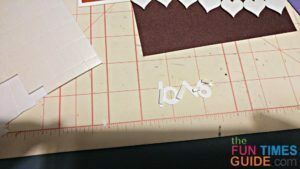 I used my Cricut Expression to cut ¾” hearts from scraps of cardstock using the ROYGBIV colors (Plantin Schoolbook cartridge). You could also cut hearts by hand, or with a punch, or use stickers. Place each heart on the line, touching the one next to it. The hearts on the ends should be straight, while the others can be slightly angled to follow the line. Each end heart can also very slightly overlap the top panel, to give the illusion that it flows onto the next card — which is 4-3/8″ x 6-3/8” purple rectangle (cut 2 of them) on my card. The white card base is 5″x7” when folded. I added a purple 1-inch word “love” from the Walk in My Garden cartridge. Inside the card is a second purple panel. “Happy Valentine’s Day” is the sentiment that I stamped on a 1” x 4” white card, using a Hero Arts Valentine stamp. The sentiment card is the same size for all 3 hearts cards, using the colors of the card. For the next card, I decided to go with a slightly smaller card — in traditional red and white. The hearts and “love” are the same sizes I used for the rainbow card mentioned above. The top white panel is 3-1/2″ x 5-5/8”. The red panel is 3-3/4″ x 5-7/8”. And the white card base is 4” x 6-1/2”. The hearts are aligned the same as Card #1 — with the curved line heading the opposite way. There is a second red panel on the inside — with the same sentiment as Card #1. To add extra pop to the hearts, I added a 1/4” circle foam dot to each one. The shadow under each heart adds subtle dimension to the front of this homemade Valentine card. The final card is the fancy version. The cardstock colors are purple and cream shimmer (a 12″x12” single sheet of each). Each top panel is the same as Card #2. I added a bigger 1-inch heart to the front, and I used foam squares to cut small pieces for dimension on the “love” word. The inside has a second cream panel and sentiment on purple shimmer paper. 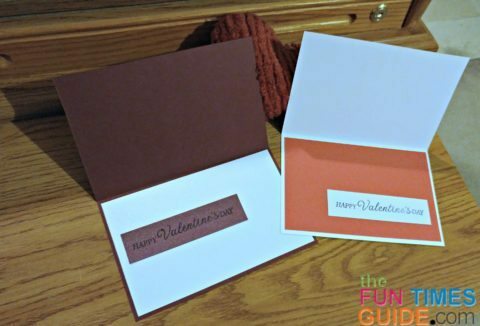 Each card has a handmade envelope made from coordinating paper (as seen in the very first photo). 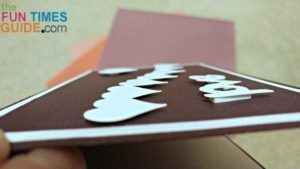 Use any paper or envelope you have on hand that compliments the colors in your card. 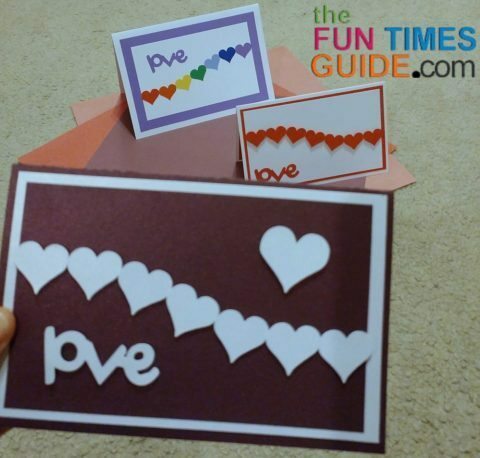 Happy Valentine’s Day card making!